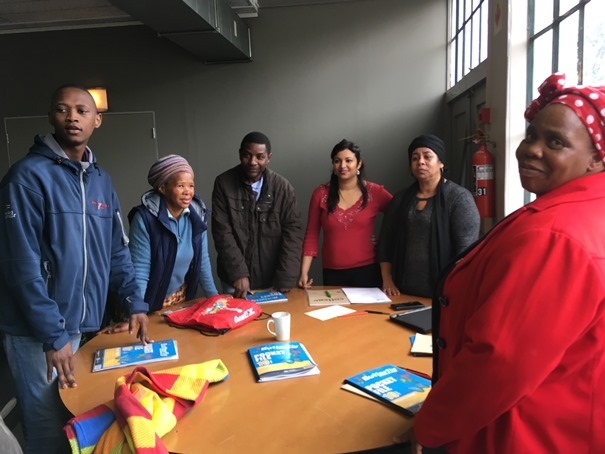 The Environmental Monitoring Group (EMG) hosted the 5th annual Western Cape Water Caucus Water and Climate Change School for Activists in September 2018. The school is a stimulating and creative space for exploring water and climate change from a range of perspectives, in order to support community based activists in their on-the-ground work. Water Caucus members motivate for their participation in the school by identifying a project they are already working on, that they would like to deepen or expand. These projects include things like: a drought awareness raising programme in Kraaifontein; securing access to land and water for food growing in Site C; installing and maintaining rain water tanks in Makhaza; understanding water bills, restrictions and water management devices in Dunoon. In the lead up to the school, we collect all of the questions, concerns and areas of interest being raised by the participants, and design the week long school in response. This year, we covered themes like ‘Making friends with water’; ‘Understanding municipal water’; ‘Stories about the drought’; ‘What does climate change mean to / for me?’; ‘Exploring gender, water & climate change’; and ‘How do we organise in response to all that we have learnt?’. The water and climate change school is always a highlight of the year for EMG and the Western Cape Water Caucus. It is an opportunity for reconnection, reflection, deeper engagement with the complex issues that we don’t have time to dive into during ordinary meetings, sharing of rich knowledge and experience, and important conversations about the politics of building a movement for environmental justice. And it is always a lot of fun, too! This entry was tagged caucus, climate, EMG, environmental, forum, monitoring group, network, school, water, workshop. Bookmark the permalink.